“I guess it’s spring, I don’t know, it’s always 75 degrees with no melting snow,” Jenny Lewis of Los Angeles’ band Rilo Kiley sings plaintively in one of my favorite songs, Does He Love You? And I know what she means. If it weren’t for the bright floral dresses at the mall and the marshmallow peeps at the drug store, I’m not sure I’d know the seasons had changed here in LA. You have to really be looking for spring to see it, but once I open my eyes to it, signs of the earth’s annual rebirth are all around, even in a city with blue skies all year round. Thanks to last month’s rain, the mountainsides turned from brown to green, bright orange poppies cover the fields outside the city, and magnolia trees are bursting with pink flowers. 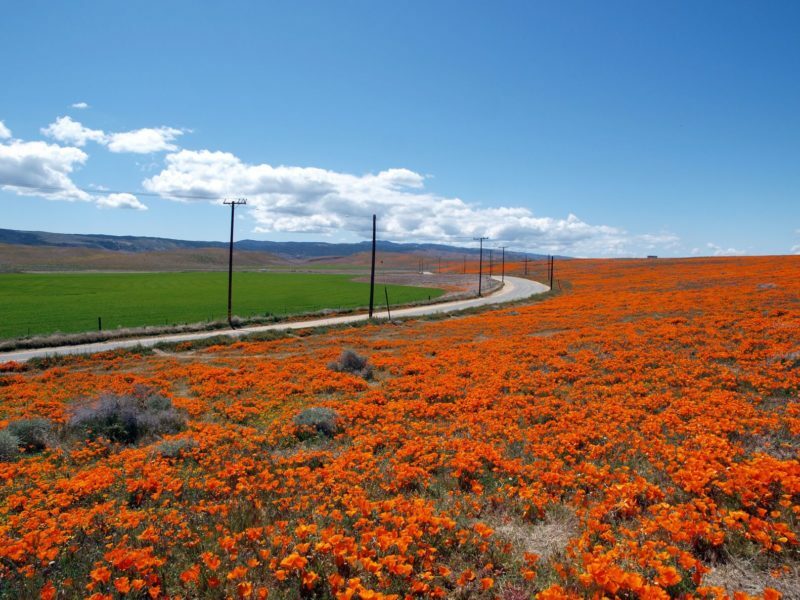 Spring flower-spotting in LA means looking for poppies and lupine, wildflowers that grow in unbelievably bright blankets across the Antelope and the San Jacinto Valleys. The funny thing about Mediterranean climates is that fall and winter are really the growing seasons, and spring is kind of a last gasp of beauty and color and growth before summer descends and puts most of the native plants in dormancy. You’re not actually supposed to plant in spring in semi-arid climates like ours — planting time is in the late fall or early winter, before the rainy season. But old habits die hard and I have to resist buying and planting thirsty spring beauties like lilac and bearded irises and hydrangea. (The California-friendly alternatives like ceanothus and Douglas iris make me think of the a pretty girl-next-door in jeans and a tshirt standing next to Sofia Vergara in a gown on the red carpet. One overshadows the other.) 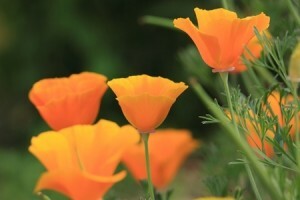 This year, I’ll try to appreciate spring the SoCal way, enjoying the wildflowers and the fact that it I live where it’s a warm spring day most of the year. Which reminds me … I have yet to visit Rancho Santa Ana Botanic Gardens and see the amazing native plants they have there, so this post will be a further push to do so. Thank you Lynn, lovely pics!